I posted my recipe for shrimp ceviche over a year ago, but I couldn’t resist pulling it out one more time for a demonstration on WCNC’s Charlotte Today Show yesterday. After all it’s the perfect hot weather recipe and in Charlotte we have plenty of “hot.” Refreshing, colorful, and easily made ahead, this is the appetizer that you’ll want to serve to friends at your next BBQ. I know the addition of ketchup seems strange, but trust me on it. It cuts the acidity of the lime and oranges and balances out the dish. And while popcorn can be used in place of chifles, I urge you to make the extra effort to find green plantains and fry your own. They are so easy to make and with a generous dusting of salt, they are irresistibly good. Unfortunately for us here in the Carolinas local shrimp are hard to come by these days. A cold winter resulted the local white shrimp population off the coast of North and South Carolina being decimated. That means that until the population recovers (1 or 2 years), shrimp from Florida may be our best bet. 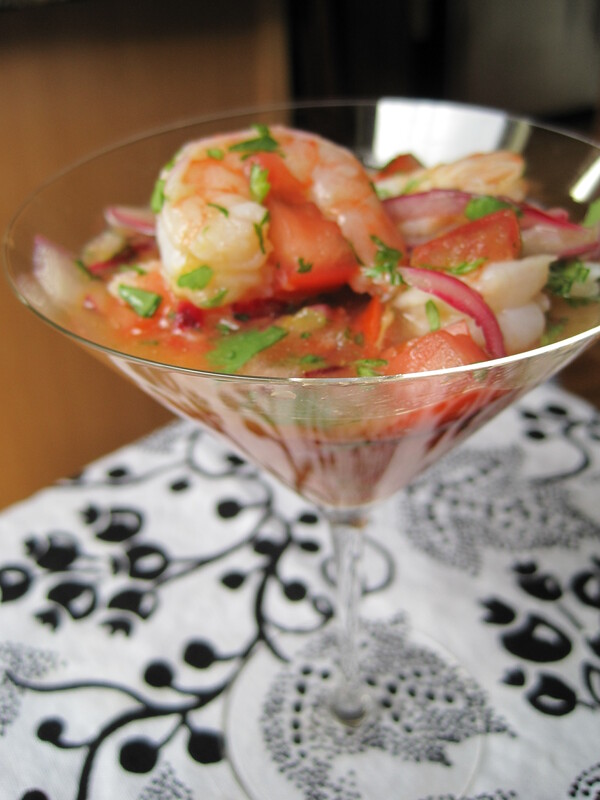 Which, if you are lucky enough to get your hands on some shrimp, is all the more reason to raise a martini glass of ceviche in their honor. Fill a medium saucepan with water and bring it to a boil. Add the shrimp and cook briefly for 3 minutes or until just cooked through. Remove the shrimp using a slotted spoon and place in a medium bowl. Reserve 1 cup of the cooking liquid and discard the remainder. Whisk together 1 teaspoon of salt and 1/4 cup lime juice in a small bowl. Pour the salt and lime mixture over the shrimp and toss to combine. Cover the shrimp with plastic wrap and allow the shrimp to marinate in the refrigerator for at least thirty minutes. Meanwhile, rub the remaining 1 tablespoon of salt into the onion slices and let them sit in a small bowl for ten minutes. Using a strainer, rinse the onion slices repeatedly to remove the salt. Squeeze the onion slices to remove any water. Place the rinsed onion slices in a small bowl and toss with the remaining lime juice. Note: Rubbing the onion slices with salt is a technique that removes the harsh flavor of the onion and makes it milder. Once the shrimp have finished marinating, add the onion and chopped tomato to the shrimp and lime mixture. Whisk together the reserved cooking liquid, the orange juice, ketchup, olive oil, and minced cilantro in a small bowl and then pour it over the shrimp. Allow the mixture to marinate for at least 30 minutes in the refrigerator before serving. Serve with fried plantain chips or popcorn. *Chifles (fried plantain chips) are the traditional garnish for ceviche and can be purchased at local Latino supermarkets like Compare Foods. Chifles can also be made at home by peeling and thinly slicing a green plantain and then frying the plantain slices in hot oil until golden in color. Drain on paper towels and then sprinkle with salt. Serve immediately. Looks fantastic. You are an Ecuadorian cooking expert!